Contributing to stable, rules-based global security is one of Australia's national objectives. Since 1990, the Royal Australian Navy has conducted maritime security operations in the Middle East Region, which remains strategically important to Australia's economic and trade interests. HMAS Warramunga (II) departed her home port of Fleet Base East on 8 October 2017 to commence the ship’s deployment on Operation MANITOU. Warramunga is supporting international efforts to promote maritime security, stability and prosperity in the Middle East region. The ship is operating as part of the multi-national Combined Maritime Forces, predominately tasked to support Combined Task Force 150 for counter-terrorism and maritime security operations. 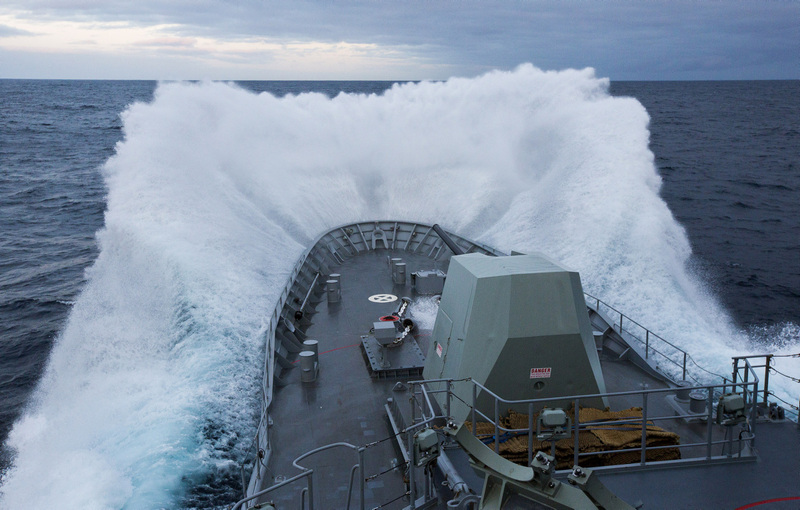 HMAS Warramunga breaks through the ocean waves whilst transiting to Fleet Base West prior to deployment to the Middle East region.